"Can you guys tell me the ways you've used (or seen used among your colleagues) QR codes in the classroom please? If you haven't used them (or seen them used), let me know that too please." In my effort to "quickly respond" to my colleague, I figured I would create my own blog post about QR Codes to share with others outside of my cohort. QR Code is a "quick response" code which allows users to quickly and easily visit a website by scanning a specific QR code with a mobile device. They are often used at conferences and in classrooms to provide an efficient way for audience members (and students) to access websites. Here is a brief definition provided by Wikipedia. I typically use QR codes when I want my students (or teachers) to quickly and easily access a website. This is pretty much the only reason why one would use a QR code. It doesn't work for apps, or software, it pretty much only works for easily accessing websites on mobile devices. 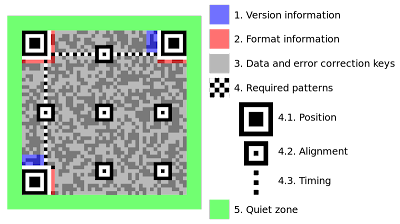 Below is a great picture provided by Wikimedia Commons which identifies the key elements of a QR Code.